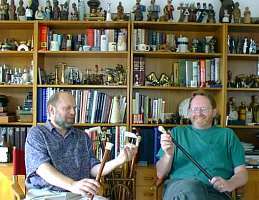 John Stanley arrived at my new Virginia home to view my new corkscrew displays. He had driven three hours from his home in North Carolina passing up a dozen plus Saturday morning flea markets. He had packed some corkscrews in hopes of making a trade so the adrenaline was flowing. 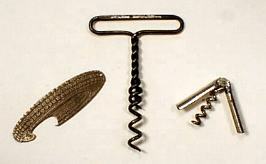 When John arrived, we looked a couple of hundred corkscrews while Bonnie prepared lunch. Several times John stopped in the viewing to ask my opinion of values (hmm...what's up here?). After lunch, I suggested we go visit all of the antique malls in Salem and Roanoke. So we went off on a four hour trek that netted just one opener for John. 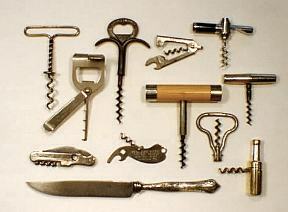 We viewed a few more corkscrews and then it was nearly time for dinner. John suggested he go out to his vehicle and bring in a box (ah, I think I know what's up here). We went out on the deck and viewed his treasures while Bonnie cooked dinner (poor Bonnie). Then we ate and it was time to get serious. John feigned a bit of poking around in the collection and then he headed straight for the Walker barmount with Hinckel Brewing advertising on it. John put the Hinckel barmount on the desk next to his box of goodies. A black and chrome picked from Steele & Johnson Mfg. Co.
A knife with cigar cutter advertising "Mintzer & Kneisler, Inc., Philadelphia, Pa., Butchers and Bakers Supplies"
A powderhorn American design patent with advertising "Vendome Hotel, Not the Newest but the Best, Evansville, Ind." 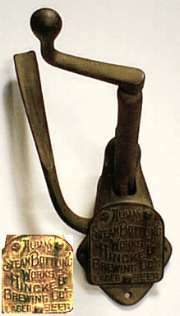 A bottle roundlet with a depicting a face on a bottle in open position and stating "Crooked but he's got a pull." John said "So you want those for the barmount." I said "Well maybe but..." and scratched my head. John said "Wait a minute..." and he was off on a hunt to add more to his pile. 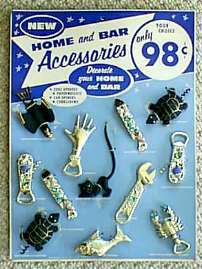 He came back with a "Continental" Tire figural, a Stroh's Beer twisted wire T and a Vaughan's Dainty advertising a brewery in Warsaw, Indiana. He said "Now Don..." and scratched his head. I said "Now John..." and stared over the top of my Walmart magnifying glasses. Beads of perspiration were emerging from our foreheads. We agreed that we were close to a deal but John had a slight edge. Before dinner John had shown me a 14" x 19" Point of Purchase display from the Metalart Company of Rhode Island. It had several very ugly openers and corkscrews mounted on it. I pointed out a door to John and told him that I could hang it behind that door and save embarrassment when someone came to view my collection. I knew John's wife would be pleased to hear that he was able to leave the display at my house, so the deal was sealed. We made the trade.